When Kim from Cravings of a Lunatic asked me to do a guest post on her lovely blog, there was only one answer: Of course! I’ve admired Kim’s blog for some time. It’s written in a funny, candid voice and is full of inspiring recipes. Having recently become blogging buddies, I can also tell you that Kim is a thoughtful, supportive individual, the kind that you’re lucky to have in your corner. We spent some time considering what recipe to include and settled on one that Kim herself would never post: quiche. Kim hates eggs and is lactose intolerant so this egg-based quiche with ricotta is definitely a recipe her readers wouldn’t otherwise get from her! It’s just too bad she can’t try it (head to her blog for the recipe). I like quiche for many reasons, but its main draw for me is its versatility. I love that you can throw in basically whatever you have in your fridge, and that there is an endless possibility of meat, vegetable, and cheese combinations for the filling. It’s also a versatile dish that can be eaten for breakfast, lunch, or dinner, hot or cold. Since I always have puff pastry and eggs on hand, it’s the kind of meal I can throw together quickly using what I have on hand. For the recipe, you’re going to have to head over to Cravings of Lunatic. Tell Kim I sent ya, and that I say hi! Thank you! I know you’ll enjoy Kim’s blog as much as I do! Thanks Kiri! Isn’t Kim great? She cracks me up too! I can’t go to her blog without smiling. Yum-popping right over to kims blog! I love quiche for the same reason too that it is so flexible. Cold quiche in summer and hot quiche in winter makes me very happy! It’s so true! It’s great any time of year, for any meal, and with (almost) any combination of ingredients! Seriously, who doesnt love a kissy quiche?? I am so touched you are guesting today Katherine. This quiche looks so delicious I may have to rethink my stance on eggs.A monster sized hug to you for being so gracious. And a huge Lunatic welcome to those who swing by to see the recipe. What a beautiful quiche, Katherine! I,too, love the versatility of quiches. Egg dishes are a staple in our house! Thank you Hannah! We eat a lot of eggs as well. Oh and I just discovered your blog and your website – they’re awesome! I will enjoy checking them out! Aww thanks so much for all the nice comments! I hope you enjoy the recipe if you give it a shot. Let me know how it turns out! Looks delicious! yum! Is it easy to get bacon in Israel? Thanks Vered! It’s actually way easier than I thought it would be to get bacon here as there are a number of Russian markets that have it readily available. It’s pricey and not as good as in the US, but it’s there! Yum! This is so colourful and enticing! going to head on over to Kims blog to check out your recipe. Thank you Anna! Glad you’re heading over to Kim’s! Isn’t Kim the best? 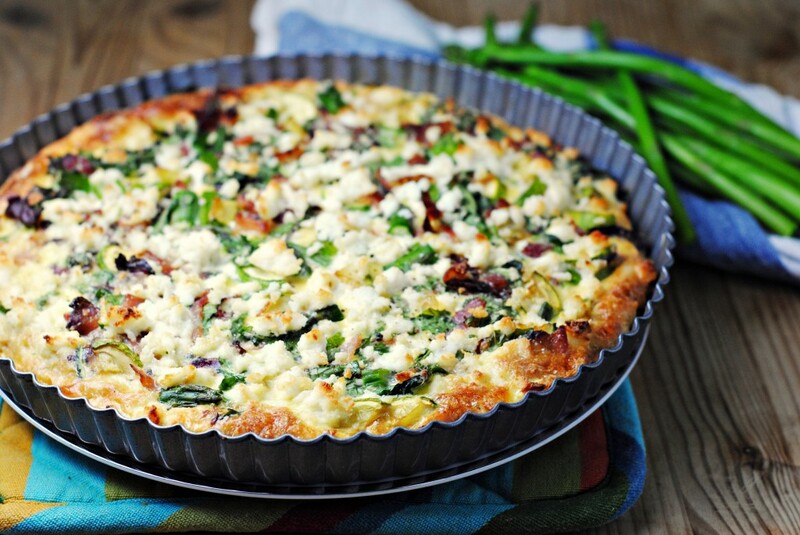 I was so glad to see your guest post on her blog today…what a fabulous quiche! Thanks to everyone who popped by my blog to see Katherine’s gorgeous quiche today. I am so thrilled with her guest post. Also everyone’s sweet comments. I love making you all giggle. Brightens up my days. Thanks to YOU Kim!! That would be so much fun. I know we’d have a blast together! Beautiful quiche! I love that there are lots of nutritious ingredients on top. I’m heading over to Kim’s site now! Thank you Nami! Yes, quiche isn’t the most healthy dish (with all that egg, bacon, cheese, and pastry) so I felt the need to pack it with nutritious ingredients too! Thank you Theresa. Hahaha nothing like late night munchies with nothing on hand!